HP has worked through and through on their Elite 800 series notebooks and have come up with not just refined functionalities but have equipped the new editions with over the charts hardware as well. More specifically, HP’s clamshell designed EliteBook 830 G6, EliteBook 840 G6, EliteBook 850 G6 and the convertible EliteBook x360 830 G6 are getting an upgrade. Starting with the most notable one, the Sure Sense technology. If you are not familiar with the concept, Sure Sense is an advanced malware detection program that works alongside Windows Defender. HP recognized Sure Sense as a cutting edge technology instead of just another anti-virus due to its light footprint on your machine. HP claims that running Sure Sense won’t choke your system’s arteries and would work seamlessly even without an active internet connection. These are alongside Sure Sense’s obvious characteristics: lightweight performance capabilities, ability to flag known and unknown ransomware and HP Sure Click. Sure Click will be the system’s defence mechanism which sandboxes browser tabs and allows you to browse untrusted websites and open suspicious attachments in a protected virtual environment. HP has equipped the EliteBook 830 G6, HP EliteBook 840 G6, and HP EliteBook 850 G6, and the HP EliteBook x360 830 G6 with a privacy shutter to save you from prying eyes, a whopping 18 hour battery backup, and a 1,000-nit screen. The Elitebook 830 G6 and EliteBook x360 830 G6 will come with a Core i3-8145U additional option while Core i5-8265U and Core i7-8565 Whiskey Lake processor options are common for all four editions in this lineup. The options of memory go up to 32GB for RAM and up to 512GB for SSD storage. The editions vary in screen sizes as well. The EliteBook 830 G6 and x360 830 G6 will come with 13.3-inch displays. Whereas the 840 G6 rocks a 14-inch panel and the 850 G6 is a 15-inch laptop. You can also get additional custom specs with the 14-inch EliteBook 840 G6 and 15.6-inch EliteBook 850 G6 and add a Radeon RX 550 GPU. So there are a lot of options to go about here. 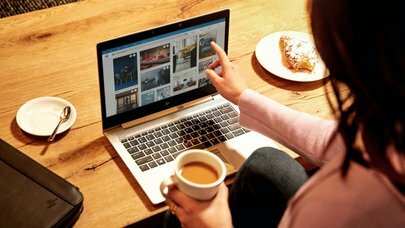 The EliteBook G6 however, has been specially blessed by HP with an embedded touch sensor and an in-built webcam cover. However, the EliteBook x360 830 will star an anti-glare, glossy or Sure View touchscreen display. Elitebooks in 2019, will have full support for 4G LTE data connectivity, the latest Wi-Fi 6 standards, Bluetooth 5 and HP’s Extended Range Wireless LAN technology. One thing we know here for certain is that the Elitebooks will leave no room for a patchy, disruptive browsing experience and will ensure reliable connectivity to other peripherals as well. While little is known about the pricing of Elitebooks, but we can most certainly be sure that they won’t be cheap. The Elitebooks will start hitting the shelves in May with only x360 830 G6 to be available in June.